Andrew Badecker raised the 60,000 big blind to 130,000 before Moon Kim moved all in from the big blind, having Andrew covered. Andrew quickly made the call, tabling [Ac][Kc]. It was a classic race as Moon held the [4h][4d]. The flop was huge for Andrew as it fell [As][5s][2s], leaving Moon drawing to 6 outs or runner runner spades to chop. The turn [3h] changed everything, giving Moon a straight. Andrew could now only tie with one of the two remaining fours on the river. 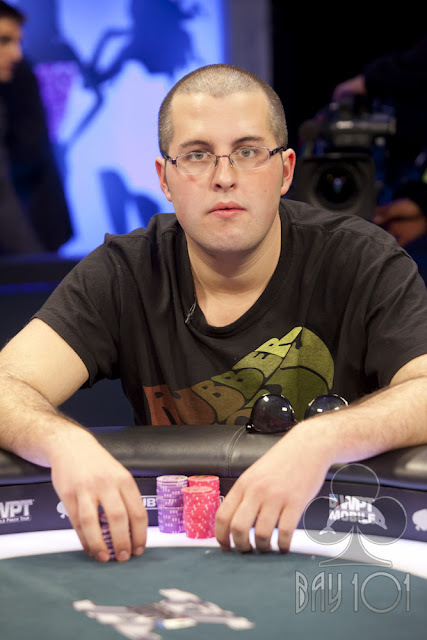 It was not to be as the [8d] hit the river, and Andrew was sent to the rail in 5th place, good for $192,300. Moon Kim now has a monster chip lead with over 5 million in chips, almost twice of Erik Cajelais in second place.